Antonio Mugica with “Yellow” by Hermann Mejia. Courtesy of Antonio Mugica. My father was a collector and an art lover, so I grew up appreciating art since I was a kid. His collection wasn’t really that big, but it did include some amazing pieces from his home country, Spain. This became an early influence that persists to this day: my love for Picasso, Miró, Tàpies and Chillida started then. My own approach, however, has been more world-centric, and I have had more means to build my collection than what my father had. I am sure he would enjoy my collection very much if he was still with us. In spite of the fact that I am a technology entrepreneur, I truly believe that there is nothing more important than art. Of course, when I say art, I include all the arts: music, literature, visual arts and even design. Creating good technology is also art, although it is rarely recognized as such. I think this has happened, to some extent, with all the pieces I have. On renowned artists I am particularly inclined to modern art and what was happening in early 20th century and the forces that revolutionized art at the time: Klee, Kandinsky, Matisse, and many others, and of course, most of all, Picasso. Then starting with Picasso, I do have a special preference for the iconic Spanish artists that I mentioned before. I am also a big fan of New York artists from the 80s, with an unexplainable attraction for Basquiat, as well as Warhol and Haring. Many collectors today find this as too obvious and maybe it is, but I can’t help loving it anyway. From the post-war British school, I love Freud and Bacon, and contemporarily I have a soft spot for Banksy, especially his early works. 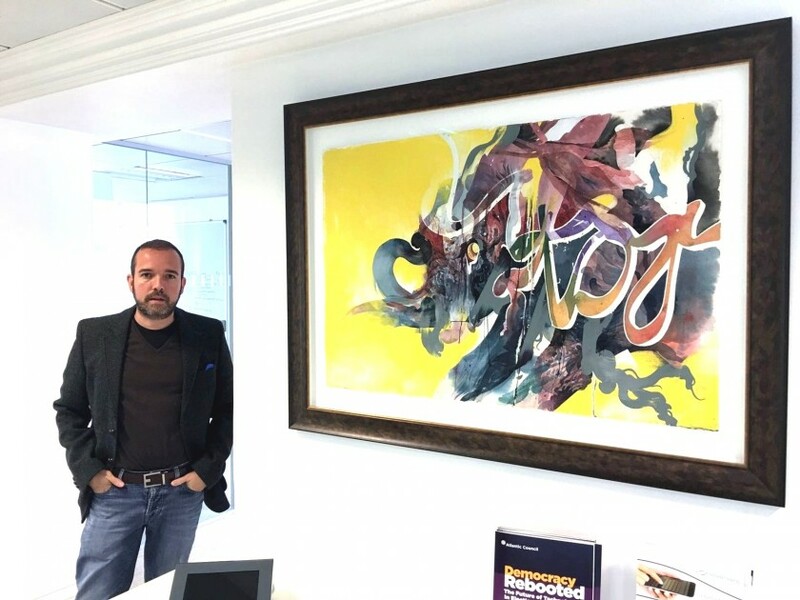 On emerging artists, I was especially attracted to Adrian Ghenie, and more recently to Hermann Mejia. I believe these two are among the most interesting young artists out there. In the last couple of years, Ghenie is clearly beginning to receive all the attention he deserves. My collection is in the different properties I own, as well as in my offices around the world. Would you wish to present your art collection publicly? I have no particular interest to do this, but if someone ever wanted to do it at a great venue, I would be open to it in an anonymous fashion. I believe, though, that there are many other private collections that deserve more attention than mine. It is all about the piece – that is the most important. After that, of course I don’t want to pay prices that are above the market estimate, especially on established artists. Despite the fact that art is all about emotion, I try to make unemotional decisions whenever I invest in anything. For emerging artists, I bet on those that I believe are making a difference, and I bet hard if I sense the artist is proposing a new language for art – a “new way of seeing” just like the great masters did in the past. So far I’ve done well with this rationale. I like to meet them if there is an easy opportunity to do so. Sometimes meeting the artist makes you understand his/her work better. However, sometimes meeting them makes you really NOT like them, and then it is hard for me to like their work. That happened to me with a very well-known British female artist. I was unconvinced about her work, and meeting her made me realize what an empty and horrible person she was, and thus, what her art really meant (nothing). 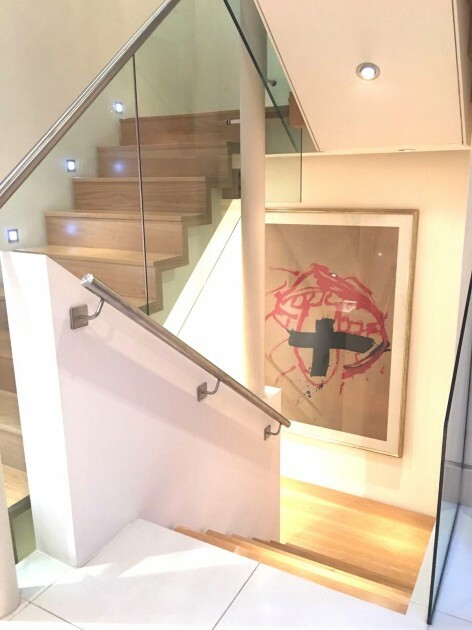 An artwork by Antoni Tapies is lighting up the staircase. Courtesy of Antonio Mugica. What is your favorite place to explore or experience art? Why? Museums are the obvious answer, but the truth is I love galleries and I love urban art. I enjoy especially when art appears unexpectedly. Living in London is a paradise, there is so much space and energy devoted to art that you can always have a full plate of delights to feast on. Can you name three emerging artists who should be on our watch list? Adrian Ghenie, Michael Dweck and Hermann Mejia. Artist Hermann Mejia is having a solo show in Munich at the moment, and right after that, another solo show at the Museo de Arte Contemporaneo de Caracas (MACC), so that should be amazing as well. And I never fail to visit the modern and contemporary art sales at Christie’s and Sotheby’s in the fall. 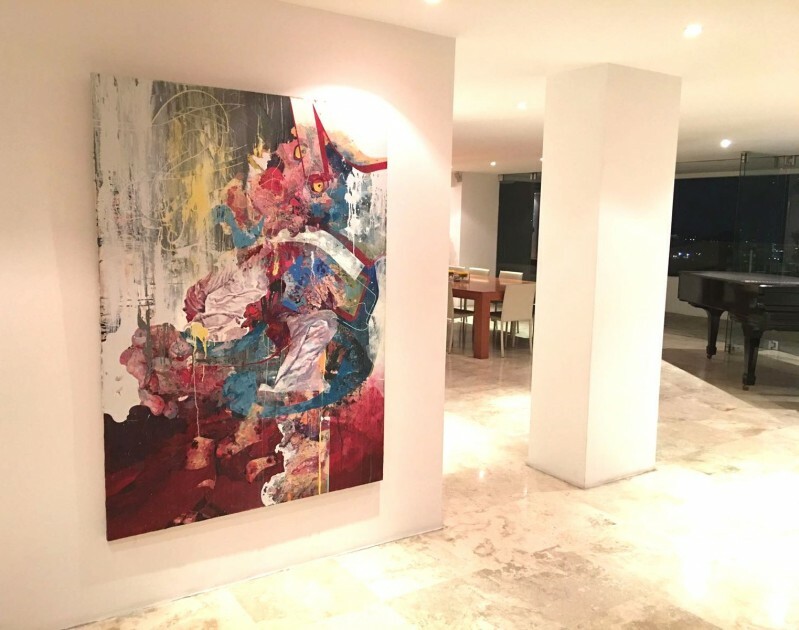 A piece by Hermann Mejia displayed at home interior. Courtesy of Antonio Mugica. 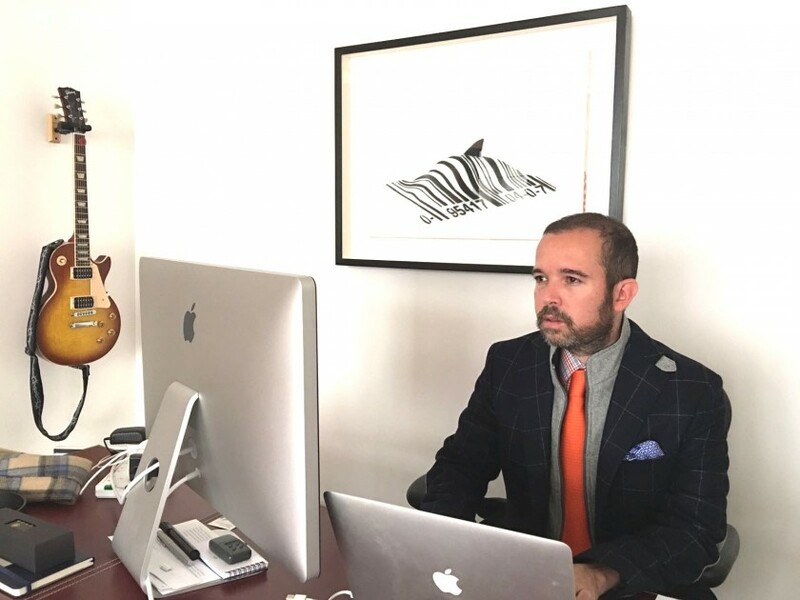 I would imagine you are quite busy as a CEO of a multinational corporation, how do you strike the work-life balance and eventually spend time on art as well? I have no work-life balance, and I don’t even believe in the concept. Do you imagine asking Leonardo da Vinci if he had work-life balance…? If you like what you do, that is your life, and it is more fulfilling than sitting on a virgin beach with turquoise water… That being said, I can still sit in the said beach, just not for too long. Art is everywhere. I enjoy art every day. Your profession involves logical and systematic management tools and infrastructure while art in general is rather unregulated or expressive. How do you find both of them in you? Do you see any link between the two? As I mentioned before, creating good technology is also art, so there is a very creative part to my business. Also, business is fundamentally based on strategy and tactics, and this makes it a highly creative process as well. Of course, then you also have the pure managerial and administrative stuff which is not creative at all, which is, thus, the part I like the least about my work. I wish I could entirely delegate that part, but so far I have not been able to accomplish that. The CEO with “Barcode Shark” by Banksy at the back. Courtesy of Antonio Mugica.